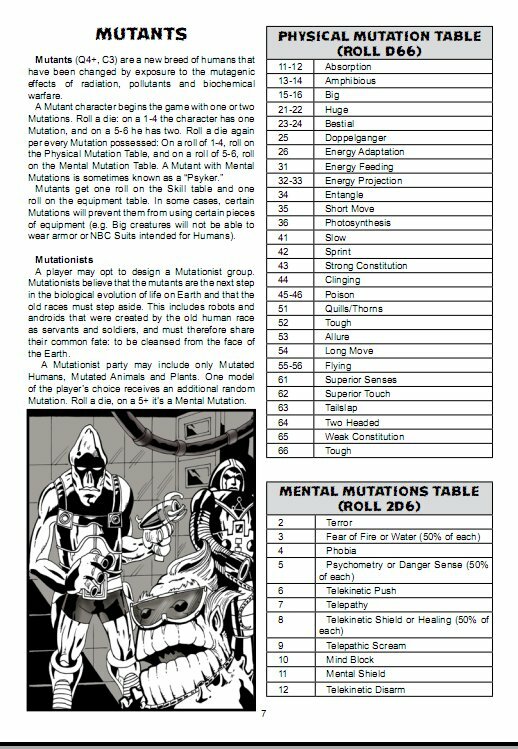 Mutants and Death Ray Guns (MaDRG) is also based upon the Song of Blades and Heroes (SoBaH) rule-set, and is from Ganesha Games as well. This is their post-apocalyptic sci-fi game system. While most of the rules for combat and movement are the same, there are some distinct differences between this game, and SoBaH. The rulebook is 40 pages, and I've reviewed the printed softcover, but I've seen the pdf version as well. Overall I think it's a really nice rulebook. SoBaH came first, and you can see there's a similar layout, and design, but you can also tell they've tried to do one better as well. There's a lot of illustrations throughout the book, and it's very clear that some of the art was totally inspired by the late Jack Kirby's sci-fi comics of the early 70s. There's a lot of Kirby-esq illustrations throughout, which totally remind me of the Kirby classics like the New Gods, OMAC and The Forever People. Even the cover is totally Kirby inspired, there's no denying it. Being this is a post-apocalyptic game, there is a variety of specific types of appropriate characters that you can create a group from. These groups are as follows...Pure Humans, Mutants, Mutated Animals, Mutated Plants, Androids, Robots and the Wretched. The Wretched are plague carrying, zombie-like former humans, with dark blood oozing out of their orifices. They even get 2 extra charters per party, when utilizing a totally Wretched pure party. Mutated Plants sounded really silly to me at first, but this also opens up the door to using some extremely cheap bunches of aquarium plants as player pieces, and wildly painted plant creatures. Right away the Mutated Plants reminded me of the classic Lost In Space episode with the vegetables. Androids and Robots are two different classes, as androids are synthetic humans, where as robots are more mechanical, and the robots are the strongest of all of the classes with a Combat score of 4 by default. 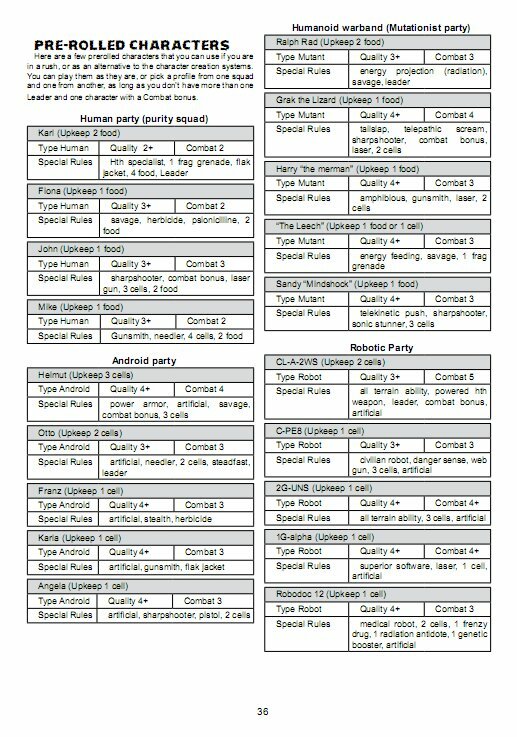 You can build a party with a mix of all of the above, but there are bonuses to creating faction pure parties too. Once you've selected the character class, creating your characters is very much like rolling up a character for Dungeons and Dragons. This I'm not a fan of at all. The approach does offer up some very unique options in character creation, but I just hate leaving the dice to decide what weapon my character ends up with, if any, what abilities they have, and so on. There are also no point values for any of the pre-rolled characters in the back of the book either, as no characters have a point value in this game. 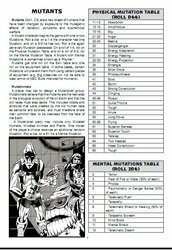 What's given does offer a lot of unique variety tho, for instance, the Mutants can end up with different mutations, which dictate what some of their special rules are. Each class also has a base Quality and Combat stat, and some special abilities that apply to their specific character class. 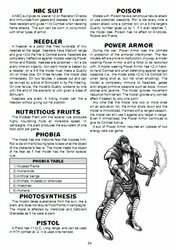 There is two pages worth of pre-rolled characters to utilize in the back of the rulebook, but it's a very limited variety compared to what they offer in the back of the SoBaH rulebook. In their defense, you can pickup and trade equipment, food and items among characters, and this design does help to convey a rag tag group of survivors, who are forced to make due with what they have, and what they can find along the way. This design also helps to balance the different classes. It's just not my cup of tea, but others will no doubt enjoy it for being that random. It's also hard to put together a What-You-See-Is-What-You-Get character, because while you might want to use that cool new mini you bought with the shotgun, it may end up being rolled with no ranged weapon at all. The very same combat and movement rules are in place from SoBaH, so three sticks are utilized for Short, Medium and Long Range (3, 5 and 7-inches converted from MM), and 3 D6 dice are all you need for the rolls. Rolling for Actions is identical too. You can choose to roll 1, 2, or 3 D6 dice, and then comparing the roll to your Quality stat value. Matching or exceeding the Quality yields that number of actions, for that character. Fail two of those dice rolls, and the turn is automatically passed to the other player, and you loose the rest of that turn. Movement cost 1 action, reloading a weapon 1 action, leaving h2h combat is 2 actions, etc. You could even decide to use all 3 actions to move three times, covering a lot of ground, but you can never attack more than once per character. MaDRG is designed in such a way that Ranged weapons are very rare in a post-apocalyptic world, and this is what I've had the hardest time with too, as it's a mindset that I MUST have a big-gun in any modern or futuristic skirmish game. Every character is considered to have a single generic melee weapon by default, and it doesn't need included in a written character profile. However, both melee and ranged combat is resolved the same way, via a comparative roll off. Both sides roll, adding their Combat value to the roll (and any modifiers), and if the attacker exceeds the defending players roll with an even number, the defender is knocked down. Winning the roll off via an odd number, pushes the defender away by one base width. 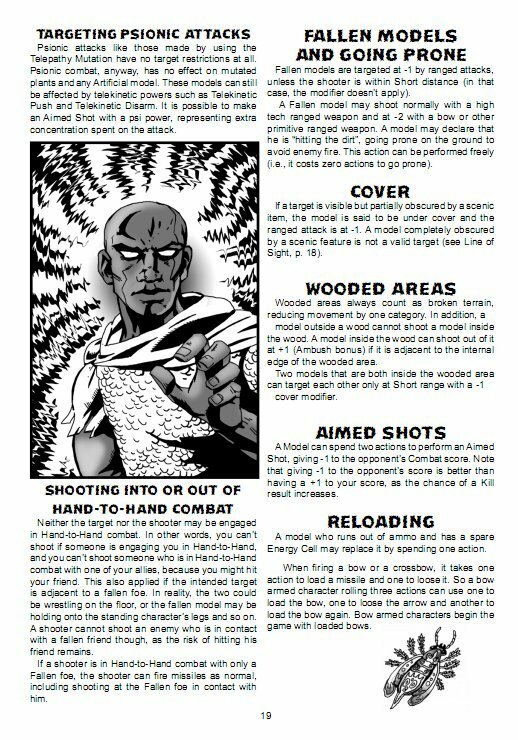 Doubling the defender's roll outright kills the character, and tripling evokes a Gruesome Kill, which kills the defender, and forces all who witness it to take a Morale test. I love the simplicity of the combat system. Like SoBaH, you can also engage targets at range, which are beyond the normal allowed range of the weapon, but at -2 for double the range, and -4 at triple the range, and anything beyond that isn't possible. To simulate that post-apocalyptic weapons are in a bad state of repair, when rolling to resolve ranged combat, you're to include a different colored die. If you end up with doubles and the result is an odd number, the weapon is considered jammed. If you roll doubles and the result is even, the weapon breaks. If you roll an unmodified 1 during a ranged attack, you run out of ammo/energy, and will have to reload next turn for 1 action. They also separate the ranged weapons into two categories, High Tech and Low Tech. A Low Tech ranged weapon would be unable to fire the rest of the game on a roll of an unmodified 1. Area of Effect weapons are also included in MaDRG, which add rules for grenades. The special rules list is what also separates this game from SoBaH. 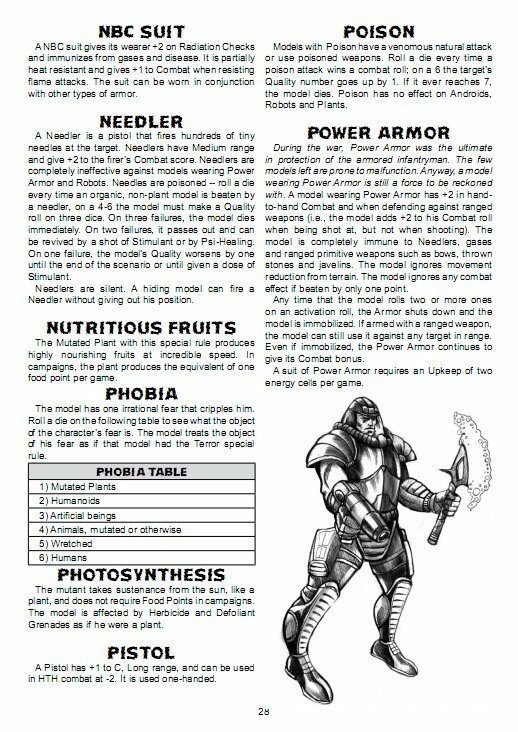 There's even Power Armor included, which grants a +2 versus Ranged Combat, and in Hand-2-Hand combat. Special Rules are also in effect for Death Ray Guns, Needler, Web and Nanite guns, Flame Throwers, Explosive Fruits, NBC Suits, and even a variety of Telekinetic powers like Shields, Push and Disarm. They did a great job in this respect, as the variety of abilities, and weaponry, is pretty cool, but it feels more sci-fi than post-apocalyptic to me. 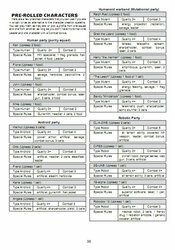 The campaign rules take up a couple of pages after the special rules section, and this is where the Upkeep comes into play. The Upkeep stat keeps track of how much food, or in the case of android/robots energy that is needed to be paid as an upkeep from week to week during a campaign. If you don't have enough food, or energy cells, you will need to decide who goes Underfed. Characters that go underfed two turns in a row have to leave the party. If you're not playing a campaign, this mechanic won't apply though. In campaign play, your characters can earn an Advance, which is an extra Skill, Mutation, Food, Equipment, Energy Cells, a single adjustment by 1 in Quality, a single boost by 1 in Combat value, or even an extra Follower. There's a number of scenarios provided too, for setting up a Campaign, where the overall goal is to collect food, artifacts and equipment. Overall regular games utilizing 4-5 models per side can take 30-45minutes max. I tossed together some Space Wolves as pure humans versus some Pig Iron Productions Kolony Feral pieces as Mutants to give a whirl, and the game really does flow smoothly, just like SoBaH. My only gripe remains... I don't like the randomness, because using the pre-rolled characters, or even rolling your own, you can still end up heading into combat without a ranged weapon. Granted you can pick up looted ones, but if the other side ends up starting the game better armed for range than you, it's no fun being the guy without a gun to fire back. I'm just not feeling it with Mutants and Death Ray Guns, like I did with Song of Blades and Heroes. It's a great rulebook, and the game is fun and easy to play, but I'm just not at all a fan of the degree of randomness it employs. They do offer an alternative method to character creation, where they suggest that you pick two things, and the opponent picks one, but this only addresses the abilities of the characters. I was told that another method of character creation can be found as a post on their YahooGroup, which will be printed in an upcoming version of Free Hack (their free .PDF supplement supporting all Ganesha Games) soon. I may pursue that, because Mutants and Death Ray Guns really is a great game, but there are just some things that I have a hard time getting past. It's really a two edged sword, because Ganesha really does portray the entire uncertainty of a post-apocalyptic world in great detail, but in doing so forces players to make due with a party, or a character or two, that they just might not enjoy playing. Again, this may just be a ME thing, as many of us skirmish gamers have a hard time dealing with change sometimes, and being told I may have no gun to shoot, or that I may end up with a character I wouldn't have picked, if given a choice, is hard to swallow. I'm getting older and set in my ways I guess. I also guess the randomness does add a tactical element, because since you really don't know what you'll be taking into battle until you roll them up, you'll have to make up your tactical strategies as you go, on the fly. If you like that kind of uncertainty, this is definitely the game to offer that. I guess I just have a mindset about how and where random elements are utilized in my skirmish games. Others mileage will certainly vary. Nonetheless the topic really is unique and interesting, and the gameplay possibilities are appealing with what's available to you right out of the book. Looking for a Mankind Versus the Machines scenario? You could no doubt put together a nice Terminator scenario with this game, since there are robots and androids to choose from. A MadMax/Road Warrior scenario would be really cool, but the lack of vehicle rules hinders this. However, Escape from New York/LA is definitely possible with MaDRG. There are so many great post-apocalyptic-looking figures out there too. I've definitely found a use for some of the Pig Iron Productions miniatures I've been reviewing, and with the addition of Power Armor, using some 40k hero figures isn't entirely out of the question either. Actually Space Wolves have that rag tag survivor-look about them, and I had fun using Space Wolves in Mutants and Death Ray Guns. The Wretched are also somewhat like the plague-zombies from Resident Evil, so you could even probably put together a really cool Resident Evil/28 Days Later-type scenario with this game as well. There's definitely a lot of potential here. The biggest draw isn't just that it's easy to grasp, and play, but that this is another insanely inexpensive rulebook. You can opt to buy the .PDF for as little as $8 and download it, and a printed softcover will set you back only $14 via Lulu.com. 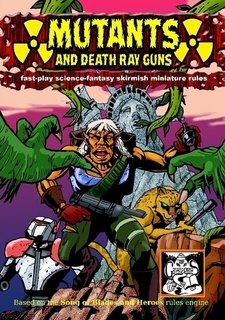 Mutants and Death Ray Guns is another very fun, and compelling skirmish game, with some very random elements, which you'll either totally love, or totally dislike, but if you can get past rolling a character, and dealing with the random results, you'll find that it can be a lot of fun, and it's one of those games that only takes a couple of games to get the hang of it. As much as I dislike the random aspect of it, I can't deny that I've had a lot of fun with it just the same, and the good definitely outweighs the bad. 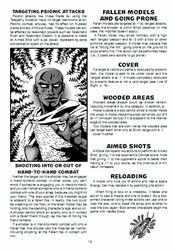 At less than a $10 bill for the PDF, you really can't go wrong with Mutants and Death Ray Guns. I was also informed that Ganesha Games will be setup demoing all of their games at Origins next week, so if you're at the Origins convention, be sure to stop by and say hi to Andrea and check out any of his games first-hand.